~~I always find it fascinating to see paintings in half-finished stages and yet for some reason I have a hard time sharing my unfinished work. When I see it on the screen I start to pick on all the things I want to work on and change instead of just seeing the process. "Often times I wish the viewer could have experienced the process; they only experience the finished product. It's as if they just see the end of the movie or novel while I was able to experience the whole thing. Seeing a painting half-finished can be very powerful. You get an idea of where it came from and you can imagine how it will turn out. I've never been one for sharing sketches of unfinished work. It's always been my nature to want to complete everything." ~~It's Friday and the first day of Summer break for us. Yay! Hope everyone has a wonderful weekend. I agree completely! There's nothing like being submerged in a drawing/painting. This is really really lovely! Your new technique just rocks. What a gorgeous piece of art!! Aside from the angel wings, it looks like my daughter! 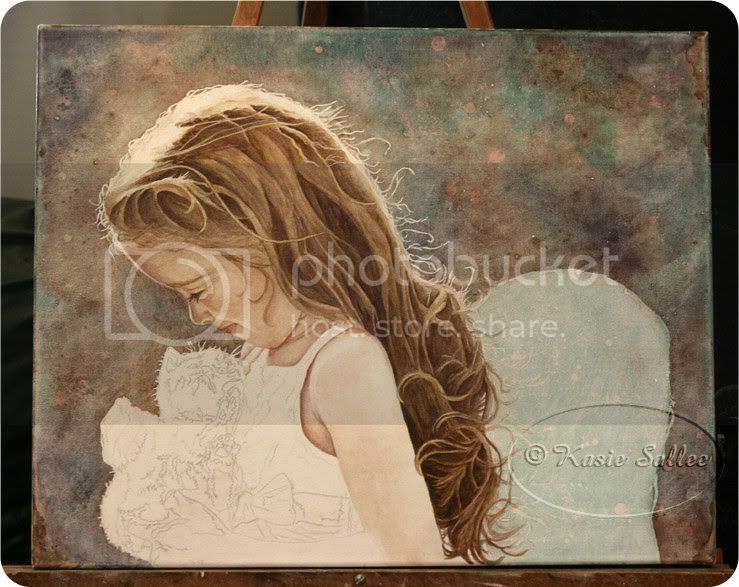 Given that I am not an artist and had no idea about the process involved, I have been fascinated to see the progress of your angel with the kitten. It has been such a joy to learn just a little about your process. I think you gain a deeper appreciation for anything once you know what is involved. Thank you for sharing, teaching and inspiring. Aww...so sweet! She is really pretty! It looks beautuful!